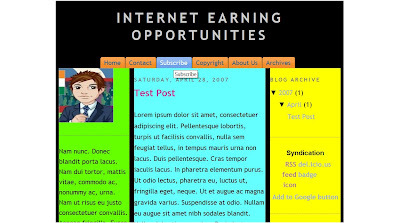 Equal Height Columns Template for Blogger. Blogger has many templates which you can pick by going to Pick New Template under the Layout tab. At present all templates are two column templates. These have a main posts column and a sidebar at the right or left for your Profile and Archives and other widgets you wish to add. They can be easily modified to add a third column in three steps. These column are however of unequal height. The height of the column depends on it's content. If you add more content to the sidebar it increases in length and then you have to add more posts so that the Main Column has a matching height. Other templates are available with faux columns to give an impression of equal height. You can download template here. To download the template right click on the above link and choose 'Save Target As' in Internet Explorer and 'Save Link As' in Firefox browsers. Save the XML template file to your PC. 2. Click Layout link on Dashboard. 3. Page Elements tab will open. 4. Click Edit Html subtab of Layout tab. 5. Edit HTml tab will open. 6. First Backup your Template. Then backup you widgets. Then click Browse button. 7. Explorer window will open. Navigate to where you hae saved the XML template file and select it and click Open. 9. You may get warning that "Widgets are about to be deleted!". No need to worry since you have already backed them up in Step 6 above. 10. After new template has loaded sucessfully you can readd your widgets. You can also try the alternative method of loading a template without deleting widgets. Add Background Picture to Header in CSS. The first step is to remove the old picture. Sometimes the picture refuses to get removed. Then the first remedy is to clear the cache. Always use Firefox browser for optimum logging experience. Save Template. Switch to Page Elements tab. Click Edit link in the Blog Title widget. In popup window click Remove button. Then click 'Add Page Element' link in the header. In pop up window choose 'Page Header' widget and choose the options and save. Here in the options you can add a new image or you can add it as in the next step. If you want to add a picture that can be easily removed you can add it as a background in the CSS part of the template. First create your header picture and upload it to Googlepages or Photobucket.com and copy down it's link. Make sure that the width of the picture is the same as that of the header-wrapper. (See code in next step for width of header-wrapper) If the width is not the same the picture will protrude out on one side. Add the background line as shown above. Replace 'LINK_OF_PICTURE' with actual link of your uploaded picture. Change the '200px' in the height line to the actual height of the picture. Save Template. Clear Cache and view blog. The Blog Title and description will be shown on top of the picture. If you wish you can hide the Blog title and description to show only the picture. How to Classify Blogger Labels? 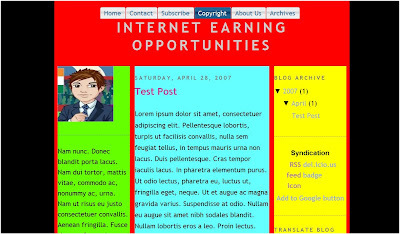 Blogger introduced Labels to categorize posts with the introduction of the Layout Template. A Label is added in the bottom frame of the post editor when creating a post. All Labels are shown in a Label widget in the sidebar. When a Label is clicked all posts associated with it are displayed. These are linked to actual posts on the blog. You can link a Label to a post at any of the above levels. The code required to display and classify labels in this style is available at this site. Download the zip file and extract all the files in it to a folder. After creating this file in Notepad copy it and paste it in a Html Page element. Different backgrounds in each post! A background put in your blog serves as a sort of branding for your blog. For example if it is a travel blog a background picture of the Eiffel Tower can serve very well. 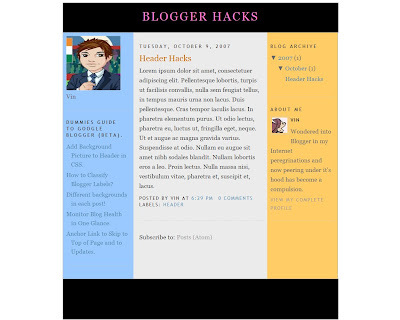 You can also have transparent backgrounds in your blog over which the blog text scrolls. First step is to search for an appropriate picture for your post. Use Google to search for copyright free images. Next step is to upload the picture to a free web host and copy down the link. You can use Googlepages or Photobucket.com for this. 2. Click on Settings link on the Dashboard. 3. Click on the Formatting subtab of the Settings tab. 4. Scroll down in the Formatting tab to the Post Template at the bottom. 7. Click on Posting tab at the top. 8. The Post Editor will open with the code already in it. 9. Replace 'LINK_OF_PICTURE' with actual link of the picture uploaded to your free host. If you do not want the picture to repeat delete the "no-repeat" in the code line. Type in your post before the </div> tag at the bottom, give it a Title and Publish. See the example in this post. Monitor Blog Health in One Glance. Google Webmasters is a very useful tool to see how your blog is doing in Google. To use this tool you have to add your blog to it by pasting a verification metatag in your template. After doing this you can login to Google Webmaster Tools and check out the various pages to see how many pages have been indexed and so on. After you have added the verification metatag in your template and added yor blog sitemap to Google Webmaster Tools you can add all the Webmaster Tools to your iGoogle personalized web page. To monitor your blog you then just have to open your iGoogle page. To do this login at Google Webmaster Tools. Click on your blog link (This will be present only if the verification metatag has been added successfully). In the sidebar click on Tools and then on Gadgets below it. Click on the "Add an iGoogle Webmaster Tools homepage" button. If it does not open right-click the button and select "Open in New Window/Tab". On the next page check all the Gadgets you want to add and click the "Add to Google" button. Your iGoogle page will open with all the Gadgets on a separate Webmasters tab. The Crawl Errors shows the errors Googlebot encountered when crawling your site. The number of HTTP errors, Pages not found, URLs not followed, URLs restricted by robots.txt, URLs timed out and Unreachable URLs are shown on both Web and Mobile versions. The Content Analysis Gadget shows Title tag issues, Meta description issues and Non-indexable content issues. This gadget shows the top search queries used by people to find your blog. This shows how many people have subscribed to your blog through your various blog feeds. Only the subscribers using Google products are shown here. To check the rest of the subscribers login to your Feedburner account. This gadget shows your sitelinks. This Gadget shows how many have linked to your blog pages. The top eight pages with the maximum amount of links are shown. Since Google takes some time to index all pages the latest links to your blog may not show up here. For this you have to check the backlinks to your blog. This Gadget shows the amount of links you have set up to other pages in your own blog. At present these are the only gadgets and more are promised in the future. Free CSS Navigation Menus in Blogger. The first step is to create posts which will be linked to the various links in the menu bar. Create a post and title it 'Contact' and put in it all the information on how you can be contacted. If you want to remain anonymous you can put in an email form on the page. Publish the post and copy down it's link from the post title. Paste link in a Notepad file and save. Create another post and title it 'Subscribe'. Put in it all your feed information and publish it. Copy down the link of the post to the same Notepad file and save. Create another post called 'Archives' and in it put all the links for your posts. Publish it and get it's link in same way. Lastly create a 'Copyright' post and do the same. Login at Blogger.com and click 'View Profile' link on Dashboard. Your profile will open. Copy the link of the profile page from the address bar and save in the Notepad file. To choose the images for the navigation bar go here. 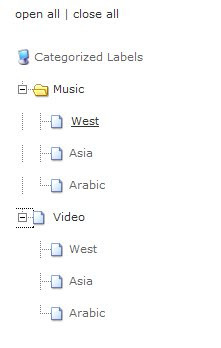 They are available for commercial or private use and you can doownload them from free css navigation menus. After this unzip the file and upload the images you want to a free host and copy their links to paste in the code in the next step. 1. Login at Blogger.com and click 'Layout' link on the Dashboard. 2. The Page Elements tab will open. Click Edit Html subtab of Template tab. 3. The Edit Html tab will open with the Template Code box. 5. Switch back to Page Elements tab. Click 'Add Page Element' link in the header. You can arrange it below the header by dragging it below the title on the Page Elements tab.